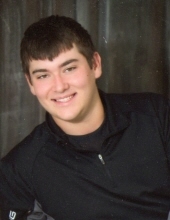 Timothy “Timmy” W. Ebert II, age 21, a lifelong resident of St. Germain, passed away on February 1, 2019. He was born April 21, 1997 to Timothy and Peggy Ebert. Timmy was a member of the St. Germain and Platteville Volunteer Fire Departments. He worked at the St. Germain Golf Course and Blain’s Farm and Fleet Platteville. Timmy was preceded in death by: his aunt Marlene Hopp; Godmother Amber Schneider; maternal grandparents Marvin and Ellen Hopp. He is survived by: his parents Timothy and Peggy Ebert; sister Megan Ebert; paternal grandparents Wayne and Sallie Ebert; and many aunts, uncles, and cousins. A memorial service will be held at 3pm on Wednesday February 6, 2019 at the Community UCC Church in St. Germain. A visitation will be held 2 hours prior to the service. To plant a tree in memory of Timothy "Timmy" Ebert II, please visit our Tribute Store. "Email Address" would like to share the life celebration of Timothy "Timmy" Ebert II. Click on the "link" to go to share a favorite memory or leave a condolence message for the family.